The Druid Theatre Company team — winners of best production for Druid Murphy, at The Irish Times Irish Theatre Awards, in the Royal Hospital Kilmainham, Dublin, last Sunday night. Druid Theatre’s celebrated DruidMurphy production scooped three of most prestigious awards at the recent Irish Times Irish Theatre Awards ceremony in Dublin. DruidMurphy – Plays by Tom Murphy, directed by Garry Hynes, won Best Production; Aaron Monaghan took home Best Supporting Actor for his role as Liam in Conversations on a Homecoming; while Marie Mullen won Best Supporting Actress for her role as Missus in the same production. 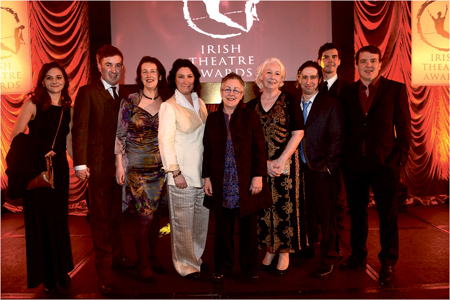 Marie Mullen was also presented with the Special Tribute Award which acknowledged her contribution to Irish theatre. The New York Times described the three play DruidMurphy cycle as “epic theatre making”, The Irish Times as “world-class”, with The Daily Telegraph saying “attendance should be obligatory”. Druid will stage Conversations on a Homecoming and A Whistle in the Dark in the Town Hall Theatre from April 12 to 20. Bookings can be made on www.tht.ie or 091 - 569777.